Hi everyone. Happy NSD. I am scrapbooking today but I first wanted to finish up a card that I created with a new stamp from Scrapmaster's Paradise. I love this little boy and his puppy. He is just sooooo cute. I paired him with Lori Whitlock's A Perfect Summer for Echo Park which was also the paper that came in SP & Co's monthly kit this month. Just a perfect match for this stamp. I started by stamping the Furever Friends stamp on watercolor paper in Archival ink. I then used my watercolor pencils and waterbrush to color it in. I layered the EP papers and sewed them with my machine. I cut the scallop banner out of some of the patterned paper and pop dotted that over the other banners. 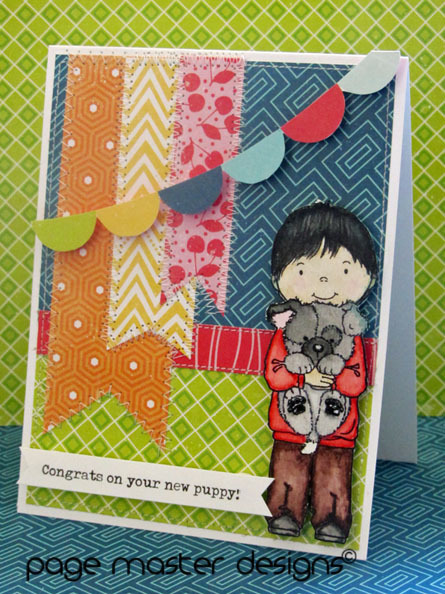 For the title I created a custom title for this card in photoshop because my little cousins just got their first puppy and I wanted to personalize the card for them. I'll be back soon with my NSD projects. What are you working on today?